You are currently browsing the tag archive for the ‘dogs are better than cats’ tag. And now, for a break from the usual introspective fare, I present a spontaneous moment of cuteness our puppy Molly presented us with last night. I was standing in the office, folding a load of laundry that I began the night before. We usually forget a load in the dryer overnight, then do the 20-minute refresh the next day. It’s a rare and beautiful thing when an entire load goes from hamper to drawers within one day. So I’m standing there, folding laundry, while Mr. Apron tap-tap-taps away at the computer, spewing words of wisdom into his blog. Molly, the smaller, younger, blonder dog, usually prefers to sit in one of the 2 chairs in the office, nestled snugly between our back and the chair back. With her long torso, she is a very effective bolster/kidney warmer. Because I was standing up, my back/kidneys were unavailable, and she didn’t want to sit in my chair by herself. 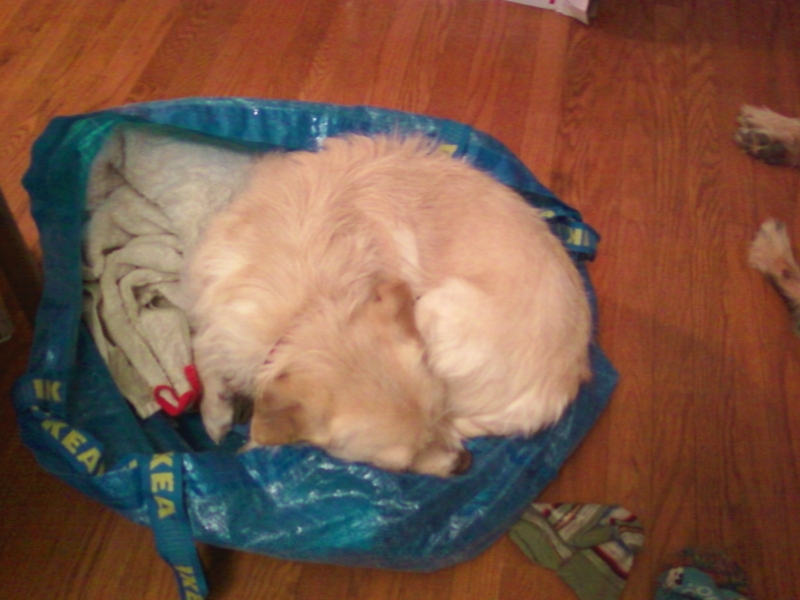 She spied the open Ikea bag of clean (and somewhat warm) laundry, stepped in tentatively, and proceeded to turn a few times to flatten the proverbial prairie grass, before curling up into the her sleeping puppy pose. I thought only cats could be this cute.